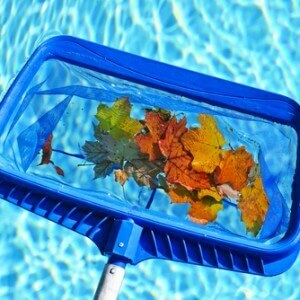 As the summer heat fades, when the kids are back in school, and fall colors start to appear in the leaves, it is time to consider shutting down your pool. Many people keep their pools open late into fall to take advantage of crisp and clear nights but others choose to close their pools before the onslaught of falling leaves and the weather changes expose their pool equipment to inclement conditions. Before you take any actions to close your pool for the season, it is important to have your water tested and be sure it is balanced. Good pool chemistry prevents calcium deposits from forming in your pool or your water becoming too corrosive and damaging equipment lines. You can either visit a pool store to have your water professionally tested (Recomended), or check the levels of pH, water hardness (calcium), alkalinity, and chlorine at home with an easy to use kit (Likely you won’t have the software that can analyze the relationship between all these levels). Either way, it is important to have stable and healthy water beforewinterizing your pool. The next step in prepping for winter is to clean your pool and place all of your pool equipment in weather-safe storage. Anything that is in your pool should be removed including all accessories or cleaning equipment. Be sure to remember pool skimmers and pool baskets! It is also important to clean out your pool’s filtration system. This means the cartridge filters, sand filters, and D.E. filters should Receive proper attention (all manuals are online ~ Be sure to read them). You’ll also need to add scale, stain, and metal control chemicals followed by circulating granular chlorine for several hours. Next, add an algaecide to prevent the growth of algae on the floor and walls of your pool over winter. After you’ve thoroughly cleaned the pool water and have put everything in safe storage until spring, you’ll need to drain the pool’s water level below the skimmer opening. 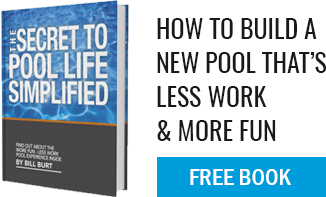 Ask your local professional for the appropriate level depending upon what type of pool you have! Make sure it is a non toxic antifreeze. There is no such thing as too much antifreeze in the pool pipes! Consult your local Pool Professional for details. The final step in winterizing your pool is to install and secure the cover. Now you should be good to go for the cold season! NEVER DONE THIS BEFORE? Consider hiring a LICENSED POOL PRO. A mistake in opening the pool in the Spring is usually an easy remedy. A mistake in Winterizing, especially in areas where the ground freezes, can be a very extensive and costly repair.